My daughter's room is jam packed full of toys, and it's kind getting to a point where my house could be mistaken for a toy shop. Trying to sort and organise the toys in our house is something that I have been meaning to do for but like with everything else it makes it makes it way down on my to do list. However, my little girl decided to get me up at 6am this morning, and there is no time like the present. As soon as I started to go through the toys I soon realised that actually she didn't play with most of them anymore, so it was time for a cull. My daughter has two toy boxes at the bottom of her cot, three in her cupboard and we have three in our living room. One is full of mega blocks, one with her happy land toys and the third one has everything else - soft toys, wooden toys not forgetting her noisy toys. But we have one small rule in our house, which is only one toy box out at time, we say this so then she doesn't become too over whelmed with the choices and keeps our home tidy. There's nothing like coming back to a sea of toys when I go make a cuppa. 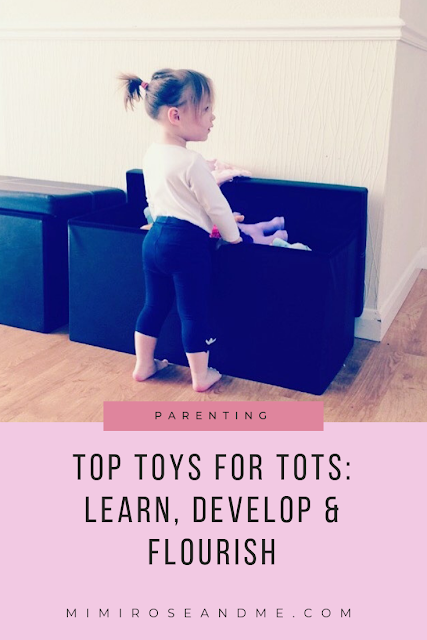 As I make my way through the cull I thought that it would be a great time to share all the toys that my daughter has and perhaps even give you a little inspiration when it comes to buying gifts for little ones. Most of these toys are timeless, robust and encourage learning. I have decided to section these top toys for tots based on the different developmental stages in childhood. Fine motor skills are the small movements that occur in the hands, wrists, fingers, feet, toes, lips and tongue. Basic fine motor skill is a child's ability to use small muscles, specifically in the hands and fingers, to pick up small objects, hold a spoon, turn pages in a book or use a pencil or crayon. 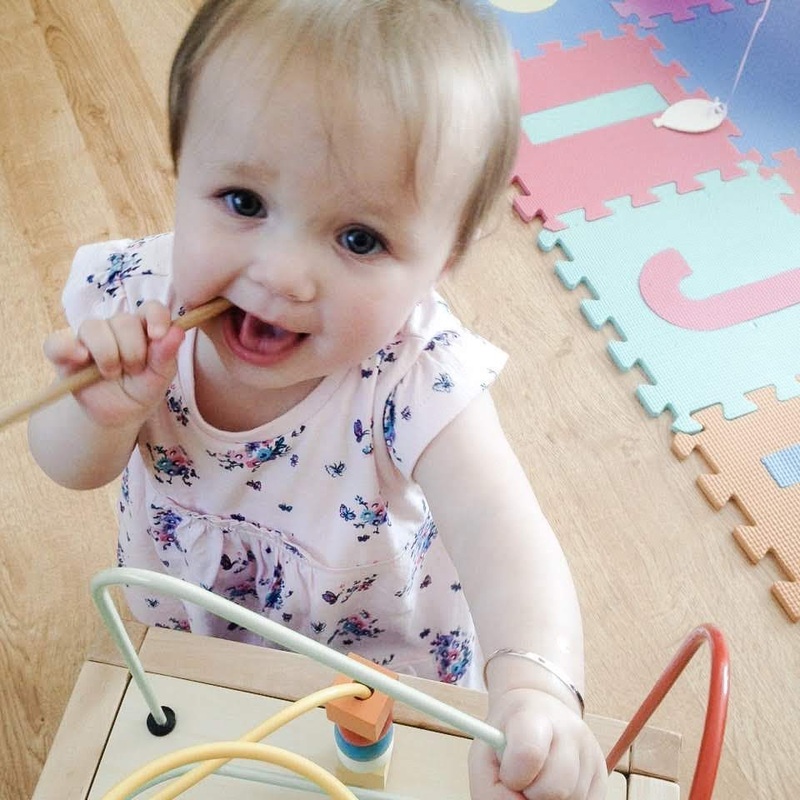 An ideal way to develop fine motor skills in babies, toddlers and pre-schoolers is by using threading toys, lacing toys and hand eye coordination games and activities. So here our favourite fine motor developmental toys that I am sure any little one would love and include: twisting and turning activities, bead frames, buttons and laces to thread, threading shapes and a variety of templates, boards and cards for lacing and threading. When it comes to toys, you can't really go wrong with wooden toys. Of course, wooden toys are trendy in their own right. In fact, they have been trendy for decades, if not centuries. 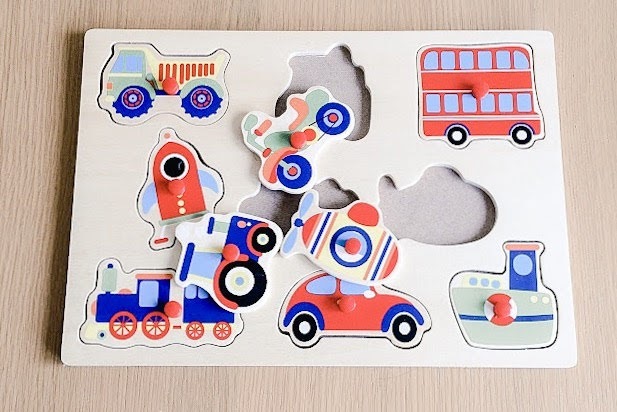 Your grandparents and great-grandparents were learning with wooden toys when they were young and your grandchildren and great-grandchildren can also learn with wooden toys. They are a timeless classic. 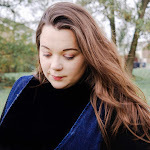 But let's face it, nothing can even compare to wooden toys when we talk about the quality of a toy, there are very robust and durable meaning the can last years and years. Our favourite wooden toys at the moment is a £4 wooden trains and track set. It has be the best £4 we have spend, our daughter will honestly sit there and play for hours. 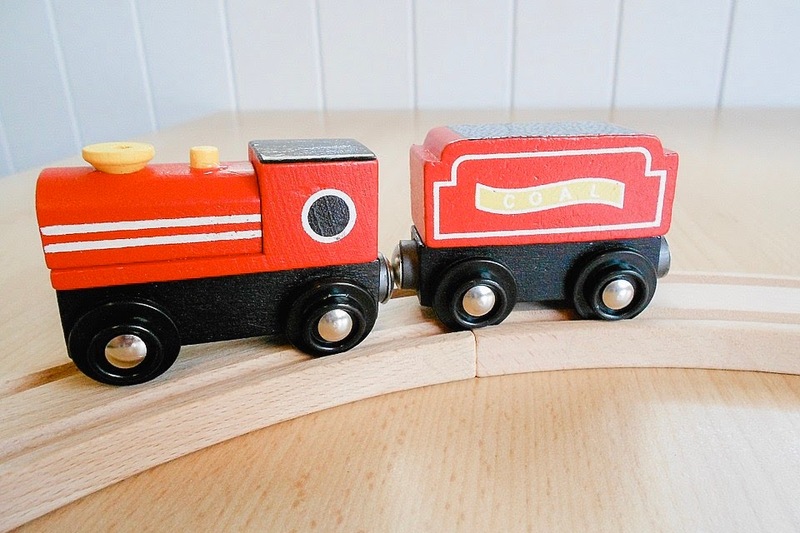 The trains are held together by magnets so they can easily be pushed and pulled around the track - this wooden train set will be sure to keep any little one occupied for hours. Children love any chance to get messy, don't they? I know my little lady lady love any opportunity to get her apron on and get her hands messy. Children are normally curious and inquisitive anyway. They only need the right guidance to show their creativity so get them poster paints, finger paints, water colours, colouring books, crayons and modelling clay in different colours and see their creativity unleash. Another great toy to get little children to help improve their fine motor skills is without a doubt, playdoh! Depending on their age you'll have to be watchful over them trying to eat playdph, however Playdoh tastes awful so I doubt it would be too often. You can get playdoh in all different colours imaginable, textures and even some glittery ones and is a toys great for all ages. For babies, toddlers, and young children, stacking toys are great for promoting fine motor development. Don't be deceived - these seemingly simple toys pack a big punch when it comes to early learning development. 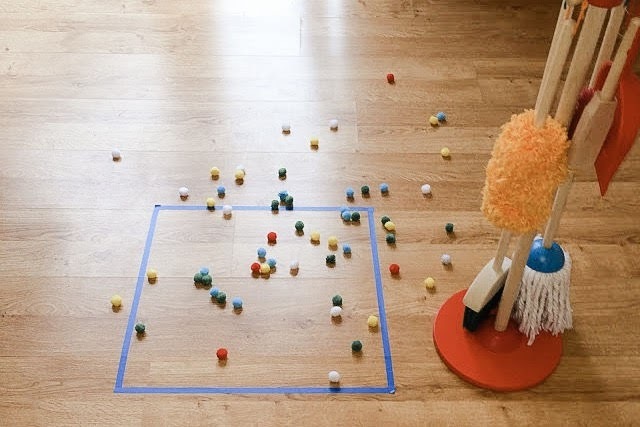 For young children, picking items up and putting them in place helps them learn the important skill of intentional grasp and release, as well as how to control and position their fingers. The larger chunkier shapes are great at first whilst getting to grips with it all. Gross motor skills are abilities that allow people to do things that involve using the large muscles in the body, arms and legs to complete whole-body movements. That includes activities like climbing and jumping. Children rely on these skills to have successful experiences at school and on the playground. Exploration of environment such as playing on a playground is a way for children to advance their gross motor skills and improve their overall physical development. When a child is navigating a playground they are actually working on many gross motor skills without even knowing it. These are a great way to begin developing on those gross motor skills. A dolls pram, a wheel barrow or push and pull toys are great toys to help with arm and leg strength. With increased mobility, children will be able to explore their environment and surroundings which helps to develop their social interaction skills. Ever since I can remember my daughter has been a little obsessed with push along vehicles, they are great because they are durable, realistic-looking and they make lots of sound - which is bound to attract any child. My daughter's favourites have to be her alphabet bus, fire engine and quite recently her ambulance. To be honest my husband and I love to watch her play with her ambulance because certain buttons play music and its lovely to watch her do the actions to head, shoulders, knees and toes. Toys that will help develop arm, leg and core strength and/or challenge their balance and coordination will help children develop those gross motor skills during play. Rocking chairs, rocking horses, and rocking vehicles. These types of toys help to develop core strength, posture and balance. These are so importance when it comes to your child developing on those gross motor skills, especially when it comes to sitting and standing. This Little Tikes Rocking Horse has been a great toys for my daughter, and for us when we are feeling a little silly. This smooth rounded rocker has a high seat back, easy-grip handles and easy mount low seat designed for safety. This was a first birthday gift for our daughter and it's still a favourite. My daughter also loves to drop all her toys and my washing pegs down the slide, it's so lovely watching her smile and laugh as she plays. This slide is perfect for small toddlers as it's not too big and only has three steps. 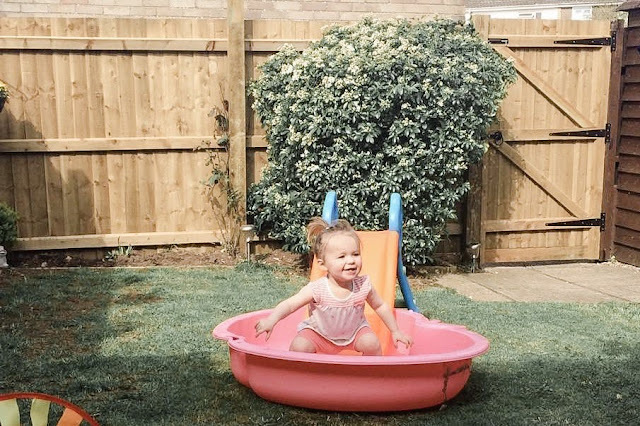 When we were trying to get our daughter a slide, quite a few of them were very large so this is perfect for smaller tots. Through play, children are gaining confidence, learning decision making skills and acquiring critical thinking skills that will prepare them for adulthood. Children are curious and constantly learning about the world around them. New noises, sounds and objects for them to discover. Cognitive development is the ability to process information, reason, remember and express emotions. There are so many great ways in which you can encourage cognitive development such as dress up, jigsaws, puzzles or role play. From early childhood right through to adulthood we love to play with puzzles and jigsaws. They are a great way to challenge our brains and exercise our minds. That's why they are important educational learning tool for toddlers and young children as they provide many skills and mental learning benefits and opportunities. Puzzles come in a whole range of themes and topics such as alphabet letters, shapes, vegetables, numbers, pets, transport and colours. These are such great little toys for tots. My daughter has received so many of these wooden jigsaws from family and friends so much so we have five of them and my daughter loves nothing more than to get her hands on these. Shakers are a great way to build cognitive, social and fine motor development. Shakers offer the infant a chance to create music on their own and gain some control over an object in their hand. Not forgetting making a lot of noise along the way. Shakers help to learn finger and hand control offering intricate movement from side to side, up and down and turning and twisting of the wrist. Shape sorters promote hand-to-eye coordination and problem-solving skills. They are one of those toys that every child should have at some point in their development. I have to say that we have quite a few shape sorters and I love to sit there and watch her work out which pieces fit which hole. It also a great way to teach your child about colours, numbers and shapes too. Our shape sorters are something that my daughter play with on a daily basis, and our favourite is a wooden activity cube that's jam packed full of activities that help the cognitive development. There are 5 activities all in one cube. There is a chalkboard, bead maze, flip board, xylophone and a clock that are bound to keep little hands busy for hours. There are so many benefits for creative and imaginative play from improving problem solving and cognitive skills, to boosting self-expression and critical thinking. But don’t limit creative play toy box to just arts and crafts. Toys are amazing for a child's imagination and encourage role play are just as good for creative development as a set of paints. And while there are plenty of creative toys out there, some lose their novelty value quickly. The best creative toys are the ones that kids want to keep playing with. Kitchen role play is an exciting and fun activity, which really expands a child's imagination and encourages their creativity. It gives children an opportunity to unleash their own creative minds making up some amazing recipe and explore different pretend ingredients. They enjoy experimenting with the various pretend utensils and appliances to create imaginative scenarios, either mimicking actions of adults they have seen or formulating their own uses for the objects they use. My daughter will play for hours and hours in her wooden play kitchen. Nothing makes her happier than put on her chef hat and apron and making tea and cake for everyone. Children loves to get involved with imaginative play and one of my daughter's favourite ways to do this is with this Melissa and Doug wooden cleaning set, it was a fantastic way to encourage toddler chores. Start them young, I say! But in all honest my daughter love to help. Whether that's turning the vacuum on and off, or stealing the mop and making a run for it. But since we got her the little cleaning set from Melissa and Doug she will always want her cleaning set out and get this, actually dust with it. In my opinion the best way to encourage language development in your child is to read for at least 20 minutes every day and talk about things you do throughout the day. This has to be my favourite part of the day with my daughter. She understand every story I read to her and we will even go back through so she will point out certain objects and tell me about them. There are so many different types of books that you can get for your little one and with time will really help with their language development. Reading is something that is very important to us as a family, and it's something that my daughter enjoys every night before bed. We have quite a few books in our collection that continues to grow every day. These are our current favourites. Role play gives children the opportunity to express themselves creatively and engage in storytelling. Children vocally enact the role that they are playing, which enhances their language development and communication. Dress up role play widens a child’s vocabulary as they begin to open their imagination. My daughter loves to play dress up and will always choose to be a princess, but we have a box that is jam packed full of exciting characters that she could encourage language development. Remember when playing with your child to use sounds and words which are at, or just above, your child’s expressive ability if you want them to try to imitate what you are saying. 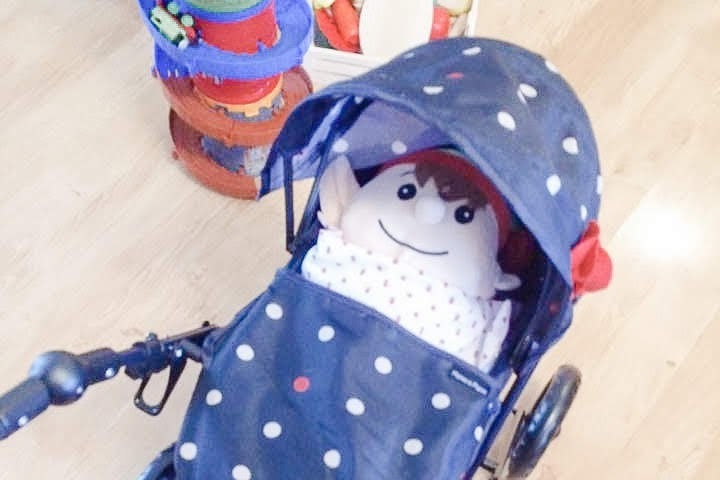 Another great way to try and encourage language development is with dolls and prams. Every child should have a baby doll and that includes boys and for the purpose developing language I would not recommend a doll that talks, eats, needs batteries, etc. I love a doll for so many skills; language, cognitive, fine motor, and self-help skills. Dolls can be used to teach body parts. Use the doll to teach basic concepts such as prepositions; baby in the bed, baby under the blanket. Use the doll to teach verbs or feelings; eat, drink, sleep, sit, stand, hungry, sleepy, thirsty, and more. You can ask your child questions to work on his understanding of these words while he plays. “Where is baby?” "Does she need changing?" etc. For young children, toys come with numerous benefits, not only are they fun, but they also stimulate the imagination and help with learning. For toddlers and young children there are so many toys that have been created specifically for a stage in development. 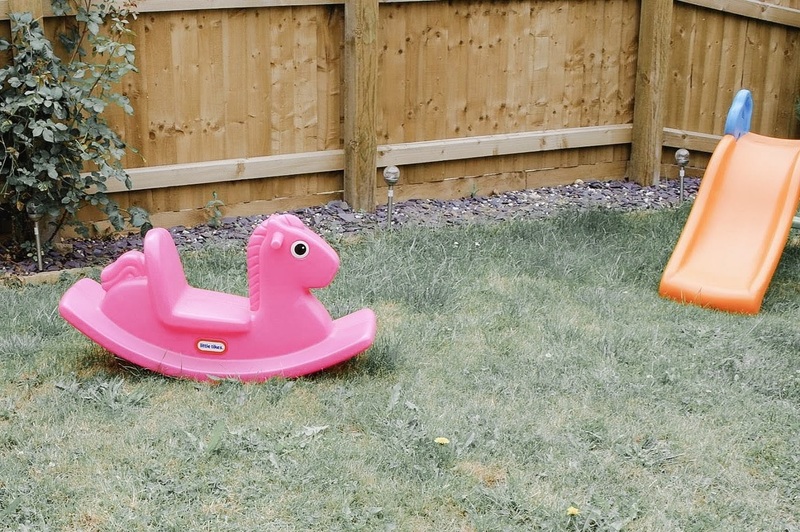 There are a number of ways where toys can be beneficial that are no only fun but they are able to stimulate the imagination and help with their learning and their development. I really hope you feel inspired with my list of top toys for tots and will understand that toys are much more than just toys! They are important for your child's development. If you like me, why not pin me?